Helps maintain healthy digestive function and restore you to your normal self. This formula is specifically formulated to treat Outside Pernicious Influence Wind-Cold plus Dampness during any of the four seasons, but primarily in the summertime. Helps maintain healthy digestive function and restore you to your normal self. Expel Outside Pernicious Influence Wind-Cold, eliminate Dampness, regulate Qi in the Middle Warmer, anti-sunstroke, anti-heatstroke, anti-vomiting, anti-diarrhea. Tonify Spleen and harmonize Stomach. Clears heat and dispels chill. For the symptoms of stomach flu. Common cold in summer, fever and chills, headache caused by heat stroke, indigestion, flatulence, vomiting, diarrhea, gas, fullness of chest, food stagnation, abdominal bloating, abdominal pain, nausea, no appetite, acute gastroenteritis, intestinal noise. 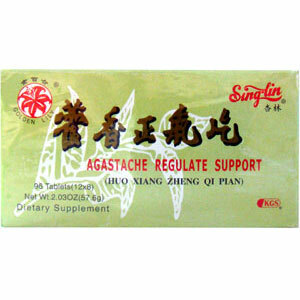 Applicable in acute gastroenteritis, food poisoning, and viral infections associated with the common cold. Useful for motion sickness, overeating, alcohol hangover, and acute gastritis. Do not use this formula if patient has no Dampness, and more signs of Heat such as dry mouth, thirst, yellow tongue coat, and fever without chills. Do not use this product if you are pregnant.